ElectronicsWeekly.com: The University of Oxford is developing organic photosensor technology. “We are hoping to have more efficient systems in terms of colour reproduction and sensitivity,” told project head Dr Paul Burn. “Greater sensitivity is the intention,” he said. “I can’t foresee any problems with achieving this at the moment.” The sensor would be similar to a CMOS photosensor, with deposited dendrimers taking the place of silicon sensors in each pixel. Charge separation within dendrimer photodetectors could be promoted by two separate organic layers or a bulk heterojunction. Dendrimers are molecules with a core at the centre of tree-like branches. Mechanical, optical and electrical properties can be tuned by changing the branches or the core. Spin-out firm Opsys was created to use the dendrimer materials Burn developed at Oxford. UPI: Ted Sargent from the University of Toronto proposes painted sensors. Sargent and his colleagues cooked up semiconductor nanoparticles in a flask containing extra-pure oleic acid, the main ingredient in olive oil. Droplets of this solution were then placed on a glass slide and spread out into a smooth, continuous semiconductor film. After bathing the films for two hours in methanol solvent, the oil evaporated, leaving behind an 800-nanometer-thick layer of the light-sensitive nanoparticles. At room temperature, the paint-on semiconductor films were roughly 10 times more sensitive to visual and infrared light than the sensors currently used in military night-vision and biomedical imaging. "These are exquisitely sensitive detectors of light," Sargent said. He and his colleagues report their findings in the July 13 issue of the journal Nature. Sargent emphasized they have not developed images using their devices yet. "We've shown sensors with single pixel detection. Our next big challenge is scaling up to a full image sensor," he said. Optics.org: "Our technology provides a lower cost alternative to achieving ultra-sensitive infrared photodetection for night-vision imaging," Ted Sargent, group leader at the University of Toronto's Department of Electrical and Computer Engineering, told optics.org. "So far we have shown ultrasensitive photodetection across the visible and out to about 1.4 microns." In addition, the team claim that in principle the idea could be extended to 2 µm using the current materials system. Electronic Business: Micron’s sales of sensor chips more than doubled during 2005, according to research firm IC Insights. The Idaho-based chip maker’s $439 million in sensor sales boosted it from the eighth-ranked vendor during 2004 into second place last year, just $11 million behind longtime industry leader OmniVision Technologies. Research firm InfoTrends estimates that half of the 741 million cell phones shipped in 2005 were equipped with cameras, and forecasts that nearly 90 percent of handsets will contain cameras by 2010. Yet most of the market’s recent growth is occurring among the industry’s largest suppliers, and especially Micron and STMicroelectronics, which supplies sensors to handset maker Nokia. 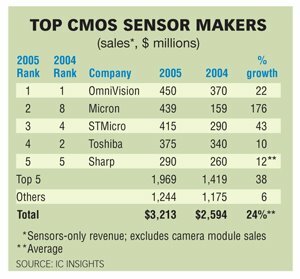 IC Insights estimates the top five sensor companies’ combined sales grew 38 percent during 2005, compared with just 6 percent for the remaining 30-plus vendors (see chart). “The big companies are getting bigger,” says IC Insights analyst Rob Lineback. Analyst Tom Hausken of research firm Strategies Unlimited says he expects that trend to continue, as the top companies gain economies of scale, allowing them to produce sensors even more efficiently. “The industry is at the point now where a few companies get to consolidate market share,” says Hausken. OmniVision kept its No. 1 ranking during 2005 by adding almost $80 million in new sales. But Satya Chillara, an analyst with American Technology Research, notes that Micron pulled ahead of OmniVision with $20 million more in sensor sales during the companies’ latest financial quarters. Chillara says OmniVision, which is making 40-percent gross profit margins on annual sales approaching $500 million, will keep doing well if its new products meet the market’s evolving needs. Avago Technologies, which ranked No. 3 in 2004 when it was still the chip subsidiary of Agilent, dropped to No. 6 in IC Insights’ 2005 rankings. Its sensor sales declined from about $300 million to $250 million following the 2004 sale to Flextronics of its camera modules business. Avago’s setback left OmniVision as the only top-five sensor maker without its own in-house chip manufacturing. Steve Noble, worldwide marketing manager for Eastman Kodak, which bought National Semiconductor’s image sensor business in 2004, predicts “huge” growth for auto sensor sales. He says Volvo and others already use Kodak image sensors for rear-view cameras. The industry also is testing sensors for blind-spot detection, lane-change warning and night-vision systems. Can be found here. It contains the presentstion, sample pictures and press releases related to 8MP imager featuring 1.75um pixels. "Foveon apparently has disbanded its marketing department, and its sales department doesn’t return calls. On the surface, this looks grim. But an explanation given by one of the ex-marketing guys, when we caught up with him, was that Foveon really needed to sell its product to manufacturers, not the public, for which a marketing department is not really required. Our understanding is that the company has been devoting its attentions to imagers for products like camera phones, more than DSLRs." CMOS image sensor (CIS) of 5-mega pixel density has been successfully developed with the smallest pixels (1.7µm x 1.7µm) ever made. The newly introduced unique pixel architecture brought excellent optical symmetry and high electron capacity. Degradation of sensitivity and cross-talk can be suppressed with the optimization of the optical structure through proper color filter material and reduction of total aspect ratio (vertical stack height / pixel pitch) with Cu back end of line (BEOL)." Yahoo-Finance: "Using its unique molecular engineering approach, Silecs has designed the new SC series coating products to improve the reliability and optical efficiency of CMOS image sensors. The SC 100 and SC 200 products are used primarily to coat and protect microlens arrays on the CIS chip surface. SC 300 is designed for planarization and passivation between the color filter and microlens arrays, and provides UV blocking for further device protection. SC 400 is designed to planarize high aspect ratio deep trench applications up to 5 micron depth, while maintaining high crack resistance and thermal stability up to 450 degrees C."
EETAsia published two good image sensor articles today. One comes from Kodak application engineer and explains operation of 4T pixel, which Kodak calls Pixelux. Compared with standalone DSCs, "camera phones have 20 times less space to work with, and they need to cost 20 times less," said Jess Lee, VP for the mainstream-products business at OmniVision Technologies Inc. Those realities have some vendors questioning whether turning a camera phone into a high-end DSC is worth an effort. Studies have found that "90 percent of camera-phone users never print pictures taken with their camera phones," said Philippe Quinio, marketing director of the imaging division at STMicroelectronics (ST). More specifically, 7 billion images captured by handsets have never been uploaded or printed, said Rutie Adar, product marketing director at TransChip Inc.
Kodak draws a distinction between the two products by calling camera phones "a photo-capable device" and DSCs "a photo-taking device." If current trends continue, "camera phones will become a niche product," said Nancy Carr, VP of marketing for strategic relationships at Kodak's Consumer Digital Group. "The reduction in pixel size to 2.2μm and eventually to sub-2μm obviously presents challenges in terms of reduced low-light sensitivity, and an associated increase in noise and decrease in overall image quality," said Tony Henning, editor of Future Image Inc.'s Mobile Imaging Report. At the heart of the issue lies the system-level design that manages the imaging flow. "Pixel technology, image-sensor processor algorithms that can compensate for bad optics and optimized specs for optics are the three fundamentals you need to own," said ST's Quinio. "Missing one of the three could be a problem." "Autofocus based on a very simple voice-coil system is too big and bulky for a thin camera phone," said OmniVision's Lee, and "its cost adder is about $4." The technology's ability to clear the stringent drop test—as high as 1.5m—required for camera phones is another concern. The drop test for DSCs isn't as rigorous. Liquid lenses such as those from Varioptic are now reaching the market; microlenses from Microalign show great promise; and prism lenses from Olympus—along with piezo-driven actuators from Johnson Electric, 1 Ltd and New Scale Technologies—promise small, light, rugged, power-efficient motors to drive autofocus and optical zoom, Henning said. All of these advances will produce "improvements in camera phones" and will become "major differentiators for the manufacturers who deploy them first," he said. Another design factor that separates the image quality of DSCs from that of camera phones is the availability of image memory. In a DSC, a raw image is first grabbed and stored to memory and is then postprocessed to JPEG, ST's Quinio said. In camera phones with no frame memory, raw images are grabbed and processed on the fly, typically using a small line buffer. Micron Technology believes it's just a matter of time before frame-level memory is integrated into system-on-chip sensors. "Multiple image frames are essential for enabling video functions in camera phones," said Gove. Micron announced its last quarter results a few days ago. According to Motley Fool "CMOS image sensor gross margins declined a bit to 40%, total imaging sales grew by over 30% from the previous quarter, reaching 16% of total sales. Micron believes that it continues to steal market share in CMOS image sensors from competitors like Omnivision."